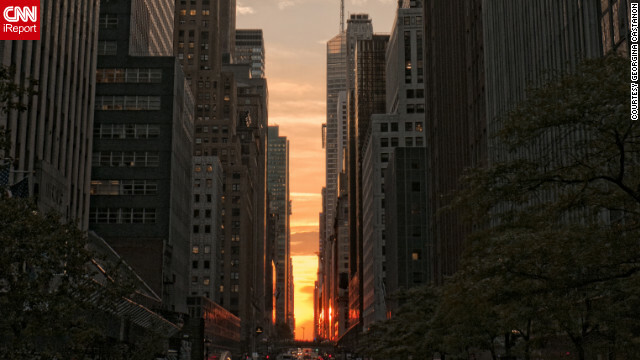 Waiting to see a full sun floating on the horizon, New York spectators instead found the urban phenomenon of “Manhattanhenge” a bit underwhelming Wednesday night. This unique event happens when the sun aligns perfectly with the Manhattan street grid. The sun creates a “radiant glow of light across Manhattan's brick and steel canyons, simultaneously illuminating both the north and south sides of every cross street of the borough's grid,” Hayden Planetarium Director Neil deGrasse Tyson, who named the semi-annual event, said on the planetarium's website. Georgina Castanon tried to see “Manhattanhenge” on Tuesday, but clouds foiled the photo shoot. But Wednesday night, she and hundreds of other New Yorkers had a little more success. Rachel Cauvin was surprised to see so many people on the overpass next to Grand Central Station waiting to snap a photo of the phenomenon. “Taxi cabs and cars were all slowing down trying to figure out what these crazy New Yorkers were doing looking West on 42nd St towards New Jersey,” she said. It was her first time seeing Manhattanhenge, and she found the experience didn’t quite meet her expectations. “It was a little disappointing because the skies were not clear and when the sun would have been dead center to the street, it went behind a huge cloud over New Jersey,” she said. Luckily, the phenomenon will be visible again on July 11 and 12, so she’s keen to try again then. Here’s to hoping for better weather next time! So apparently this occurs about 21 days before and after the sun reaches the highest point in our sky (June 20 this year). I wonder which city (if any) happens to align with the sun at the peak of this phenomenon, where the effect would occur only once, on June 20? "It is good to know, but there is little practical value." Right, because everything has to be practical. There can't be anything that is neat, cool, whatever just because. Let me guess, you think the Mona Lisa or Faberge eggs are lame. "Besides, if you believe in God, then you may find a different answer..."
You sure will, the wrong answer. "Luckily, the phenomenon will be visible again on July 11 and 12..."
I'm sure that there were few, if any, New Yorkers standing on 42nd St to watch this. Just saying. No, true NYers were up on the Upper West Side watching from a perch in CP. Not all NYers are as "cool" as you. In fact most of us enjoy the little things, like this, about the city that the press occassionally blow out of proportion for the tourists who want to experience being a NYer. Besides, most of the "NYers" who don't do these things are transplants who thing being "cool" is about being indifferent to the wonders of the city. Not the case for true NYers. Saw it yesterday on 23rd. It was lame. "'Manhattanhenge': NYC nonplussed" Come on CNN, basic mistake. Nonplussed means perplexed by, not unimpressed. 2 (North American) informal not disconcerted; unperturbed. What's funny? The OP was spot on with his definition. Unless you don't know that perplexed means confused. I scrolled down to the comments to see if someone had picked up on this. Thanks for being educated! Seems like they fixed it. People should really learn now to use a thesaurus properly. I'm more struck by "unique" suddenly meaning twice a year. "This unique event happens when the sun aligns perfectly with the Manhattan street grid."